For months, the community has discussed the massive removal of dislikes from the Diablo Immmortal trailer’s YouTube page. Content creators or influencers have also highlighted the topic widely. However, Caden of the House known as Ythisens has come forward to share his personal experience while he was still a community manager. Ythisens was one of the hundreds of Blizzard employees laid off early February 2019. But now that he is no longer an employee, he decided to come forward by sharing what happened behind-the-scenes. Blizzard Entertainment was not aware of the reason thousands of dislikes were removed. Blizzard didn’t remove them, nor requested YouTube to remove them. As a matter of fact, Blizzard still doesn’t know why that behavior happened, as YouTube has not responded Blizzard’s inquiries of the matter. It seems the exorbitant amount of dislikes might have been generated by multiple fake bot accounts that got banned by YouTube. That sounds like a logical assumption. But same as you, Blizzard has no clue why the dislikes started to disappear en mass. 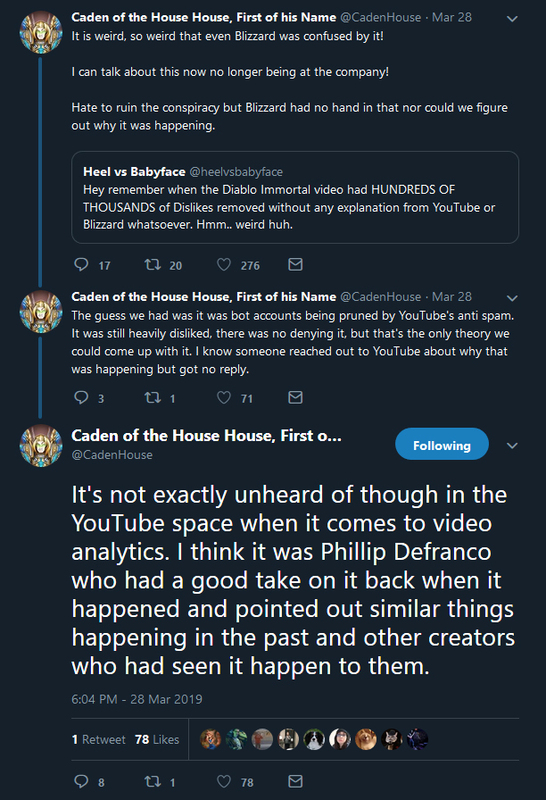 CadenHouse’s tweet may be found here. As speculated last night via tweet, Blizzard Entertainment was tweaking the PTR last night in preparation for Season 17 on PTR. The Diablo III PTR 2.6.5 will go live on Friday, April 5; and it will last for a week to test Season 17 — which features an insane buff. Player’s damage dealt is increased by 750% and damage taken is reduced by 4% for every Ancient Item they have equipped while having no Set Bonuses Active. Other highlights of Patch 2.6.5 is that Torment 14, 15, and 16 have been added into the game. So far the max difficulty was Torment 13. Added a separate upscaling option without forced aspect ratio. Removed Administrator flags from Launcher. A few days ago, Diablofans.com ended an era when they officially closed shop. There won’t be news updates anymore. There won’t be new Class builds anymore. Their won’t be new community forum posts anymore. The entire website has gone into read-only mode. No new forum threads or topics can be posted. I decided to somewhat fill the void that Diablofans is leaving in the wake of their departure. I launched the WorldofSanctuary.com forum, which can be accessed with your Battle.net Login. I recently posted that WorldofSanctuary will have a Diablo III Build section where fans will be able to “create build” or browse through “Builds” — as close as possible to what you were used to see at Diablofans. Currently, 3Di (phpBB) is hard at work developing this tool. He already showed me a preview of his progress. He estimates the tool will be live by mid-May 2019. In addition, CarlX (a coder from the Blizzard API forums) with years of Diablo II gameplay wishes to help develop a Diablo II Class build tool as well. This tool will be very helpful to those who want to play Diablo II now, or later when Diablo II: Remastered goes live. Please, feel free to share your feedback, petitions, and suggestions about what the Diablo III or Diablo II class build tool should have for the benefit of this community. Blizzard Entertainment has announced that the original Diablo game that launched in 1996 is now available at GOG.com — however, the DRM-free GOG version has been optimized for current systems by GOG. This is a very unusual move by Blizzard Entertainment, but considering the vast GOG playerbase, this could be interpreted as a sign of things to come. Tapping into that pool of players can be seen as a way to bring new players into Diablo Immortal, and better yet… a Diablo II: Remastered. It is no surprise that Diablo II: Remastered will be developed after Warcraft III: Reforged ships. It’s just a matter of when Blizzard will announce it, when beta testing begins, and when it ships. Q: Is Diablo II coming to GOG.COM? A: Diablo II and Diablo II: Lord of Destruction are currently available for purchase digitally on the Battle.net Shop. We have no additional announcements at this time. Q: What is different between the Battle.net and GOG-enhanced versions of the game? A: The original Battle.net version of the game is completely unchanged and allows players to connect to one another through Blizzard’s Battle.net online-gaming service. The GOG-enhanced version offers several quality of life additions, including minor audio fixes, up-scaling support for resolution and refresh rate control, and compatibility fixes. Please note that this version cannot connect to Battle.net and only supports multiplayer via LAN and P2P connection. Blizzard provided a FAQ for those who wish to learn more about this GOG enhanced version of the original Diablo game. You can order Diablo for $9.99 at GOG.com at the following page. On December 31, 1996, Diablo introduced the world to the dark, foreboding realm of Sanctuary. Heroes braved the depths below Tristram Cathedral to take on the Lord of Terror himself, kicking off an ongoing legacy in the world of action role-playing games. Today, players can once again explore this timeless Blizzard classic as it becomes available digitally and DRM-free for the first time ever, exclusively on GOG.COM! Diablo has been lovingly preserved in its original form, featuring HD resolution support and compatibility fixes brought to you by the GOG team to ensure compatibility with modern PC operating systems. Play on your own or with friends via network or direct IP. Explore randomly generated rooms, corridors, traps, treasures, monsters, and stairways, all rendered in their original three-dimensional, SVGA enhanced graphics. Ready to go back to where it all started? Diablo is available now direct from GOG.COM for $9.99! 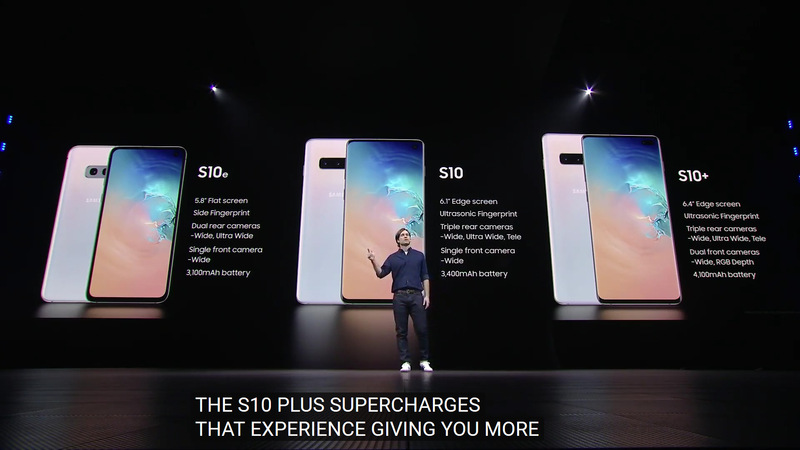 With Diablo Immortal and other Blizzard mobile games around the corner, those who already have phones might be thinking about upgrading, while those without a phone might wonder what’s the newest device in the block in 2019. **Factory Unlocked cellphones are compatible with most of the GSM carriers such as AT&T and T-Mobile, but are not compatible with CDMA carriers such as Verizon and Sprint. Blizzard Entertainment has deployed Diablo III Patch 2.6.4 into live realms. Five additional tabs have been added to the Armory. Primal Legendaries are now marked as a pentagram in the mini-map. Season 16: Season of Grandeur starts on Jan 18th. 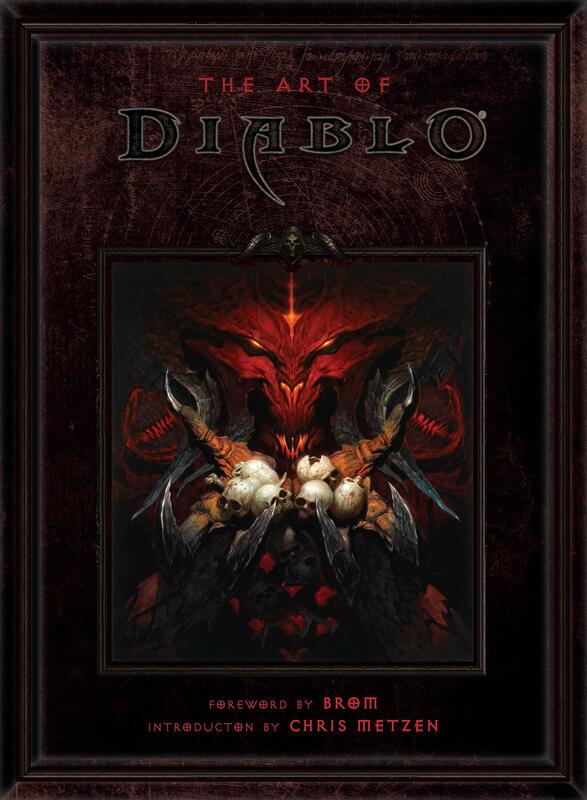 A new listing in Amazon revealed plans to launch The Art of Diablo on October 15, 2019. There aren’t further details other than the new listing and the ISBN data. You can pre-order it now for $45.00. Description: For more than 20 years, the artists behind Diablo have conjured new visions of the High Heavens and the Burning Hells, built nightmarish corridors filled with monsters and demons, and unleashed swarms of malevolent creatures upon players worldwide. The Art of Diablo plunges into the concept, design, and environmental art that has defined the world of Sanctuary and the Eternal Conflict at the core of the Diablo series. Recently, Wendy’s posted a tweet exhorting followers to download their mobile app in order to get a free Junior Bacon Cheeseburger with any purchase during #NationalFastFoodDay. Community manager Tyvalir announced that Diablo III Season 15 will end (a month from now) on January 6th; and shortly after, Season 16 starts on January 11th. In order to ensure a smooth transition between Seasons, and give players extra time to enjoy the Double Bounty Cache buff, we will be ending Season 15 on January 6. With this, Season 16 is scheduled to begin on January 11. As a quick heads-up, we will also be resetting the current Era leaderboards on January 11, so you’ve still got some time to push for that final leaderboard placement before the rollover occurs!